David Currier built the forty-five ton, sixty-foot schooner, Polly, and named it after his wife Polly Rowell (born 1775.) The Polly served in the War of 1812 and survived 113 years, but was finally scrapped in 1918 in Quincy, Massachusetts. 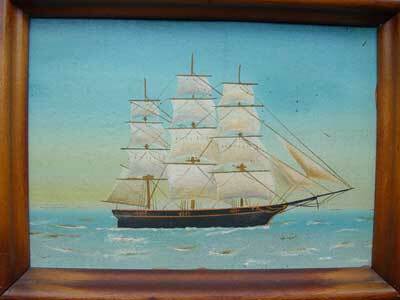 The small painting of the schooner Polly at the Macy-Colby House was painted by John Bickford (1849-1939) of Amesbury, Massachusetts in 1932 when he was 83 years old. Captain Elbridge Gerry Colby was born in Salisbury, Massachusetts in 1815. Like his father John and brother Edwin, he was a sea captain. He married twice, first to Dolly Osgood (1816-1846), and then to Ann Elizabeth Morrill (1823-1902). Elbridge's mother Dolly Bagley, was the sister of Captain Valentine Bagley, who became the subject of a poem by local poet John Greenleaf Whittier, entitled "The Captain's Well." Captain Colby died on January 31 1866, and is buried in Salisbury Point Cemetery in Amesbury, MA. Seth Hamlin Gage (1856-1940) was the husband of Mary Josephine Colby (1855-1914). 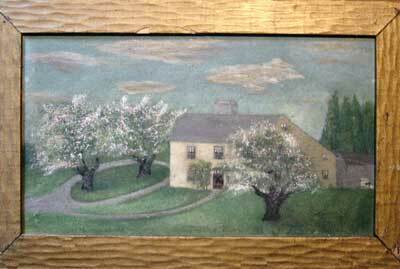 Mr. Gage painted this charming, primitive painting of the Macy-Colby House with the apple trees in bloom. On top of the hill, behind the Macy-Colby House where the Bartlett Cemetery is now, was once the Colby orchard.